There is often a belief out there that big winners in poker (especially mid and high stakes pros) have some sort of magical power or super human IQ. I know that I have been guilty of believing this at times as well. That is, putting higher stakes players on a pedestal and thinking that they are somehow far superior to me technically. The reality is that this belief is mostly false. Something that changed my thinking drastically in this regard happened a few years ago. I was being mentored by a mid/high stakes pro at the time and he was sweating me at NL50. He told me that there is actually no substantial difference in technical poker ability between the typical NL50 regs that I was playing against and the NL600 regs that he battled on a daily basis. Both understand the mechanics of solid TAG or LAG play well. Both read hands reasonably well and both understand some of the basic math behind the game. So why is one player playing at 12 times the stakes as the other then? Well in truth of course some of those NL50 players will in fact make it to NL600 one day and beyond. The only reason that they are not there yet is because they are still working their way up the ladder in online poker. However, the large majority of them will not get there. In fact if you come back two years from now most of them will probably still be playing NL50 or maybe even lower if they don't keep up with the evolution of the games. So again, what is the big difference then? Well there are a few things in my opinion. The first thing that we all need in order to move up is the bankroll. Many people at the micros massively stunt their progress by cashing out too much. I know this all too well because I did it myself for many years. People would often ask me why I played millions of hands at low stakes and didn't move up more. Well guess what? I had bills to pay! This is why I constantly preach against going pro in this game until you are playing decent stakes and have a large life bankroll saved up as well. I actually did have both of these at the time when I originally went pro but anyone who has followed my story on this blog knows that I also did not have the discipline to put in the hours back then so I allowed my bankroll and savings to regress to a point where I should no longer be pro. I chose to grind low stakes for years instead of getting another job though. But this also killed any chances that I had of moving up because I was cashing out nearly all of my winnings every single month. So even if a typical NL50 grinder is winning at a small clip (2bb/100 for instance) if he plays 100k hands a month this equals $1000. Add in another $500 for rakeback (very conservative estimate) and he banks $1500 a month. If he does not touch his bankroll for two months then he has 30 buyins for NL100 ($3000) on top of what he already had. However, if he can't stop hitting the cash out button you can see that he will never get anywhere. This is especially the case these days when most regs are extremely risk adverse nits. I am guilty here as well. This leads me to my second point, having the courage to move up. 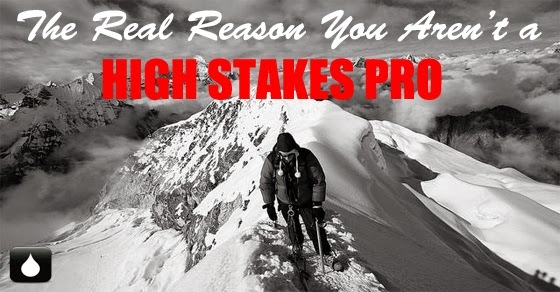 Often making the jump to a higher stake is really just a mental block more than anything for a lot of people. 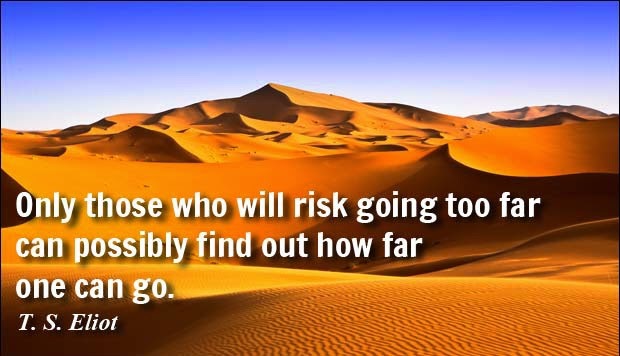 There are many grinders out there today at stakes like NL10, NL25 and NL50 who have tried making the jump to the next limit several times in the past without success. Because of this they have all but given up on even trying any more. They have actually convinced themselves in some cases that they simply can't beat the higher stake! This is completely foolish thinking for a number of reasons. Firstly, if you are even a small winner at your current limit, then it only stands to reason that you will be able to beat the higher one as well. The reality is that the players who you think are so big and bad at the higher limit are actually only marginally better than the ones who you battle it out with on a daily basis at your current limit. And let's face it, fish are fish at any limit. And as I have discussed before moving up is not easy for anybody. Most people fail multiple times before sticking at the higher limit. You have to realize that the sample size is always totally insignificant in your move up attempt and routine variance can often be the sole cause of your failure. People often also over-adjust when moving up and this is why I constantly try to warn against changing anything. Just do what has brought you success to this point. Something that I also want to discuss is taking shots. This has sort of been frowned upon by many people over the years because it involves risking significant portions of your bankroll and sort of contradicts the slow and steady approach which I have long suggested as well. But the thing is many mid stakes players and most high stakes players will tell you that they finally broke through in a big way by taking a shot at some point. What do I mean by taking a shot? Well if there is a fish sitting alone at a table that is 5 times the stakes that you normally play do you sit down or take a pass? If variance isn't on your side and the fish gets lucky he could decimate your bankroll in a big way. Many high stakes pros have lost half of their bankroll at times by taking shots like this. However, if you simply run just normal or good (remember that this happens the majority of the time) then guess what? You could conceivably double or even triple your bankroll over night especially if the fish goes on tilt and keeps reloading. This is like winning a tournament which has also propelled many players ahead early on in their careers. It will allow you to immediately feel much more comfortable playing higher limit games than what you normally play. Now I want to be very clear here. I don't want everybody who reads this post to suddenly start taking shots at NL200 with their $1000 bankroll because they see a fish waiting for action. Nor do I want people to think that extremely aggressive bankroll management is the only way to achieve success in this game. The truth is that the slow and steady approach still works just fine. There are many examples such as this small/mid stakes crusher who I interviewed earlier this year. He started from the very bottom (NL2) and even though it took several years he is now making good money and has been signed as an instructor by a major training site as well. The main point of this article is that you need to step outside your comfort zone at times and take some chances in this game if you want to truly reach your potential. I don't have a ton of experience in mid stakes or high stakes games myself but I know enough to know that there isn't really anything magical that these players have done to get there. Sure, some elite winners are technically better in some areas than others but for the most part they are just trading blinds back and forth, beating up on the bad regs and massacring the fish. This is the exact same thing that goes on in your NL25 or NL50 games. You need to let your bankroll grow unfettered if you really want to move up in this game. I typically don't suggest that anybody even think about going pro until at least NL50. And like I said you should have a large life bankroll as well (savings) so that you rarely need to touch your poker funds. If you are not able to do this though and need to dip heavily into your winnings each month then you will be the guy who is still playing NL25 two years from now. Another reason to keep your day job is so that you have the courage to take more shots at moving up and even jump on opportunities to play against a fish at much higher limits. You can do this when you have a full time job because even if you go broke your bills are still paid and you can simply reload. I have talked about playing poker professionally many times on here and the pros and cons that go along with it. However, many people still choose to go for it way too early and end up paying the consequences for it. But each situation is unique and I am not here to crush anyone's dreams. I am just here to provide some proper perspective from my experience. I recently came across one of the most hilarious and eye-opening PG&C threads that I have ever seen on 2+2. Two young English guys (early to mid 20's) grinding NL2 and NL5 all day and partying all night in Cambodia. This seems insane to me and many others given how little they are making. However, anybody who has ever been to Cambodia knows that it basically costs nothing to live in that country. They are also young and having the time of their lives. So as they state, for them living on a beach in Cambodia grinding nickels and dimes all day still easily beats working some crappy 9-5 back in cold and rainy England. Who am I to argue with that? Pursue your dreams in this game but you should also look at it realistically if you really want to move up one day and get to the real money. And always remember, the real money isn't at the micros. Nice post Nathan. I am about to make the leap from NL10 to NL25 and this post made a good job of dissipating most of my "fears". I already have almost 70 buy-ins for 25NL but keep postponing the jump up out of fear of not performing as well as I have been on NL10. The thing that worries me the most is that I am well aware that 90% of my winnings come from fish. I am afraid that at NL25 there won't be as many fish as there in NL10 and that having to battle with regs most of the time will likely get me crushed or tilted. Also, if I have a 10-15bb/100 winrate at NL10, I would have to have at last 5bb/100 winrate at NL25 to make it advantageous to move up right? Is this attainable? These are the same fears that a lot of people face. The reality is that there are fish at NL25 too and that the regs will be a bit better but by no means world beaters. You have a great winrate at NL25 so you will do just fine. Your winrate will go down but overall you will make more money especially with rakeback. Hi Demetrius , everything black rain said is correct and I believe if you have that win rate 10nl u can keep it as high as 50nl. The game is still poker and people still makes mistakes. The reason why I know this was the fact I had a win rate of over 20bb/100 in 50nl. Ofc the site you play on matters but I managed to maintain a 15bb/100 in 400nl. I also been online pro for 11 years hope this helps and my thoughts to you are valid in your opinion. Black rain is correct I play 1knl and see many of the regs playing like 200nl and also scared money. There will always be a good player off his A game as well my self included. What I always say is today I am gonna try to play better then my opponents. On any given day just try to be better then them that day or that night. That is how championships in sports are won they are better that night but they might be the under dog. Gl bro wish you the best of luck..
Great post Nathan. I'm guilty of feeling unmotivated or even questioning myself from playing poker when I have a bad taking shots... But after a few moments to think I'm able to remember back why this happens from time to time. Keep up the good work! Thanks Jorge! Yup, just always keep things in their proper perspective with this game. Moving up is just a process of rinse and repeat until it finally clicks. My problem is the Bankroll, i was really close to have enough to move up from micros to small but had to cash out 2 months ago and start from NL2 all over again, now I'm almost on NL5. My Goal for 2015 is reach NL25 in the first semester and NL100 by the end of next year. Yup that is a common problem as I mentioned. If you can go without touching your poker bankroll in 2015 it will be a big help. All the best! ok Nathan ... your point of view it's logical but you are speaking basically from theory because you didn't played at mid stakes or higher stakes yourself. I assume you mean the NL50 and NL600 players are basically the same comment? You are right, I don't have much experience at NL600 but I have lots of friends who play these stakes and I have been coached by people who play these stakes as well. This is what they tell me. okay... then what stops you from moving up ? Don't you get bored of the same limit ? I discuss why I didn't move up more in the past in this very article :) These days I am content to just play the micros because I teach and write about these limits. I am also not a full time pro anymore. Great post and I share the same experiences with you. I was a bank roll nit 100 buy in min and was a pro cashing out to often as well. I went on the worst run of my life after I ade it to 400nl moved to 50nl again. I decided to get back a fast as possible and use the once aggressive bank roll management that got me to the big games early in my career before I hit my huge downswing again. Now I bounced back with 1500 playing 50nl to playing 1knl in about a 5-6 month period and have been going good ever since. Appreciate this writing and gl. Thanks Chez and glad things are going well for you now!